Fire extinguishers perform a necessary and life-saving function, but breathing the chemicals used may cause some health problems. The chemicals are of particular concern for those suffering from medical conditions and ailments. To use a fire extinguisher safely, you should recognize the potential health effects of the fire fighting chemicals. Halon extinguishers break the chain of chemicals involved in a fire to stop combustion. The halon compounds used to extinguish fires are named with numbers designed by the U.S. Army Corps of Engineers and are halon 1011, 1202, 1211, 1301 and 2402. Users of halon extinguishers should know the type of compound in the extinguisher. Each compound has its own set of health risks and extinguishers may have different concentrations of halon. 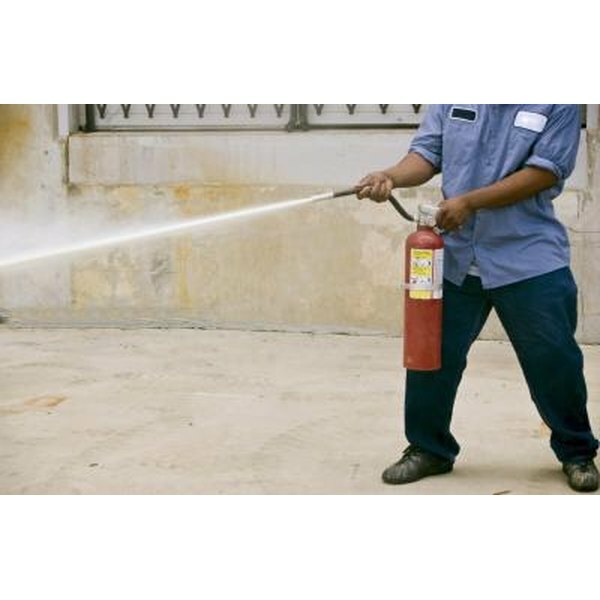 The health risks for halon extinguishers include asphyxiation, frostbite burns to the skin and skin and eye irritation. Inhaling halon compounds in high concentrations can cause central nervous system symptoms such as dizziness, unconsciousness and tingling in the arms and legs. Exposure to halon compounds may also cause cardiac sensitization including irregular heartbeats or heart attack in a severe case. Dry powder fire extinguishers cause health effects when the user inhales the powder. Nasal irritation and throat irritation such as a cough or discomfort in the chest are the result of breathing the powder or the dust. Those with medical conditions such as asthma may experience respiratory difficulty after exposure to dry compounds in fire extinguishers. Carbon dioxide fire extinguishers entered the market as an alternative to halon fire extinguishing systems, according to the U.S. Environmental Protection Agency. The health effects associated with carbon dioxide fire extinguishing systems depend on the concentration. Carbon dioxide at 34 percent concentration is lethal. When the concentration of carbon dioxide is lower, the effects on health can actually be beneficial. Carbon dioxide levels of 17 percent concentration causes health effects such as unconsciousness, coma and even death, according to the U.S. Environmental Protection Agency. At 10 to 15 percent concentrations the effects include unconsciousness, drowsiness, dizziness and muscle twitching within a few minutes of exposure. Levels between 7 to 10 percent concentration cause unconsciousness, dizziness, headache, shortness of breath, sweating and mental depression. Between 4 and 7 percent concentration, carbon dioxide causes headaches, difficulty breathing, mental depression, visual disturbances, hearing disturbances and increased blood pressure.